Magee was founded on ‘tweed’ 150 years ago – then it was a course, durable handwoven offer – designed to dissipate the damp and cold weather in Donegal, Northwest Ireland. Today we specialise in luxury fabrics for men and women’s apparel and home furnishings. 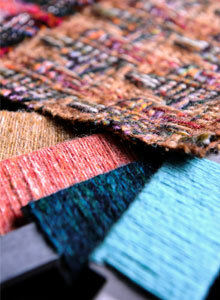 Magee have always been renowned for colourful fabrics and intricate design. Our fabric is sold worldwide, appearing every season on the catwalk in varied and wonderful creations! The Magee 1866 collections seen online and in-store showcase our fabrics in our seasonal offers. Each season we try to bring together a collection with the traditional elements as well as more directional, on-trend pieces. Hand-woven Donegal tweeds will generally always feature – in either a salt & pepper or herringbone, however recently we have updated this offer to include a twill weave, speckled with colour. The garment designers work closely with the fabric designers to bring new fabrics to each collection – for SS16 this includes detailed micro-weaves, Glen-checks and fine lightweight tweeds. In July 2016 we acquired Robert Noble – a mill established in 1637 in Pebbles. Noble specialise in lightweight, luxury fabrics, largely for menswear. SS16 highlights include linen/silk and wool blends and soft lambswool/cashmere fabrics. Magee have started designing and developing fabrics suitable for home furnishing – this area is in its embryonic stage, but we have some exciting plans for the future. A selection of our cushions and throws are available on-line to buy. 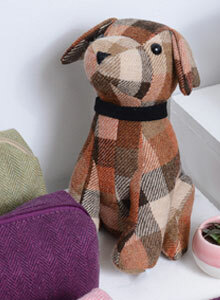 Tweed by the metre is also available online – we have noted which tweeds are suitable for furnishing. If you require swatches or any information about the product, please contact our sales team info@magee1866.com.